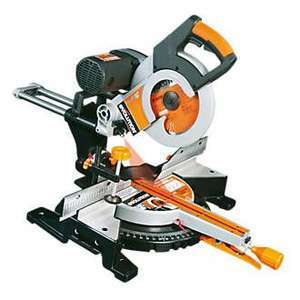 Looking for a sliding mitre saw for doing decking. However the joists i am looking at are 43mm thick. Will this saw not cut that? I noticed a max cut depth of 35mm. It would just be straight cuts. Code does't work . Cold.. Yes - You need a metal cutting blade. DON’T UNDER ANY CIRCUMSTANCE USE ANY OTHER TYPE OF BLADE. Go slow, clamp the material and do not hold it with your hands. Metal cutting blades are designed to nip in small increments at the workpiece with a negative rake angle on the blade tips. This pushes the workpiece down and back into the fence, minimising the likelihood of it biting into the material and promptly throwing that sharp, jagged piece of metal with 1500watts of power at your face. If anyone thinks they want to be holding it with their hand at this point, they won’t have any fingers to argue the case with as they get dragged into the blade. Most wood blades have a positive hook angle and larger teeth. This exponentially increases the likelihood of the saw “grabbing” it and throwing it within the blade revolution. Take note that metal cutting blades have slower RPM limits. This saw may not operate within that slower limit. This risk is a user beware one. For infrequent use on cutting metals, this might work. Anyone considering this should please do their research. No offence implied or intended, just trying to spread practical advise to anyone considering this. yes , but you'd have to buy a new blade - lidl have them in sometimes £4 - ish or other brands around the £10-ish range. --- because the blade as bought is only for wood chopping. If this has the laser on top, then this is the exact same model I bought off Amazon years back. Awesome bit of kit. Cuts very true. I've ordered this. I didnt know what bevel (kinda guessed) was, what double bevel (again kinda guessed) was or what compound (still not sure tbh) was. However I understood the sliding bit and so that was good enough for me. The Screwfix Evolution one at a similar price didnt have all the same features (that I dont get fully) so this seems good value. Planning on using it to make some basic rectangular (but deep) box frames and maybe some door mouldings and skirting. This SHOULD be sufficient for my needs? Not the cheapest it's ever been but a good price for the time being. Good for chopping stuff. 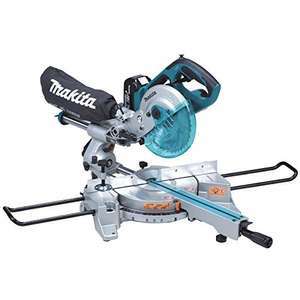 Wait a minute, where can I get a mains Makita slide compound mitre saw for £145? Why would you spend 300 more than a mains powered one though. Its good for tradesman but not ya average diyer. Perfect if you have a few logs you want to turn into firewood. This should be up to the job, as long as they are quite small logs. Ahhhhhhh double bevel!!!! Heat added. Single bevel almost always available for £149. Word of warning - you need to calibrate these saws when you get them, their factory settings are not anywhere near as reliably consistent as say Dewalt is. You need the back fence to be 90 degrees to the blade. You need the blade to be 90 degrees to the table. Check with a good quality, accurate, machined set square. Once set with a set square, you need to then look at the degree scales for the mitre and compound and make a note - are they pin accurate to the position you just set? If not, adjust them. Ignore the laser - it’s just adding complexity and can only be set for cutting on one side of the blade. Pointless on a double bevel - just use your eye and bring the blade to the wood to check cut accuracy. Wondering how that compares to the Bosch GTA-2600 what is double the price. Going to give this a shot and the mitre saw given the now 5 year warranty that think used to be 3. This is the same as the 'titan' version in Screwfix which is £59.99...which I just spent ... Very solid and heavy, the side extensions are twin chromed tubes that I guess will rust quickly ( never seen Chinese chrome that lasts) if kept in damp shed. Use furniture polish when putting away. ( Grease would be better...but with all that saw dust....) . The clamping screws are plastic capped and quite vulnerable/ delicate. Can't see them lasting long if it is moved around lots Excellent for the money though. I picked mine up today. It’s a good solid bit of tubular steel kit. Looks great for £35. V easy to assemble. I also spotted a performance power mitre saw in the store (Newhaven) for £50 - £10 less than I paid for one 3 weeks ago. So I bought it, walked out of the shop, walked back in with the £60 saw (ahem) and got a refund for it. So saved £10 there. Call me a Yorkshireman. Good price if you can find one locally - there's still three within a 30 mile radius of me, although past experience would suggest you "phone ahead", I've known the B&amp;Q online stock availability to be a little optimistic for their "specials"! I have the identical Screwfix 'titan' version at £59.99. Very good but heavy at 13.5 kg. Not stupid heavy but if I was lugging it up stairs into flats or similar it would get on my nerves. Now I know why DeWalt do it in aluminium......at far greater cost . Hot! Sweet! One near me. Cheers OP. Hmmm Scheppach as a brand seems to have gone down hill a lot since I bought my table saw and compound mitre saw from them nearly 20 years ago. Mitre Saw for £50 doesn’t sound right for me to be honest. 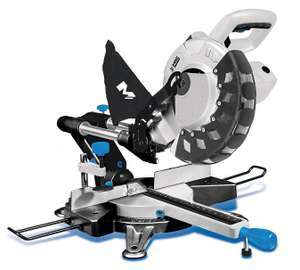 on b&amp;q website it is the scm80l model sliding saw, the hm80 model £50 is the non sliding. could be wrong . but we definitely bought the scm80l before returning it. if it is now the hm80db then that might be in a different league compared to the scm80l looking at the product promo videos. had a look at this model because of its double bevel - but has poor reviews (everywhere you can find them) and isnt that well made. probably perfectly adequate but for us didnt feel safe. model was Scheppach SCM 80L - it has a slightly less cutting depth than the PP mentioned below 58mm vs 65mm at 0 degrees. opted for the £50 performance power saw, smaller cutting width and no laser but better built and has very good reviews. and will do everything for normal diy jobs. I believe it’s the right model. Did a whole downstairs cutting laminate flooring with one of these with no issues other than a blunt blade at the end. Blades are relatively cheap and of coarse the 3 year warranty make this a good saw for general diy. Thanks for the explanation. Will look for right one. The sliding one can be cumbersome. This one is more compact and lighter. Got this exact one, been pretty impressed. I would agree to get a sliding one though, I often find I need to make a cut, turn it over, and cut from the other side to meet in the middle. I can see a scenario where that might not be possible. I bought one of these from Screwfix 14 years ago, still going strong. I've replaced the bushes that's all, oh and treated it to a new blade. I'd buy again. Never miss a 'Mitre Saw' deal again! Yeah it's a shame that these stores can't price match each other.. Considering all 20+ had been shipped within a week of posting at Friern Barnet it at least drives up sales lol. A lot of other stores have them scanned at £42 rather than £50, but suppose that might be the standard pricing. Lol. I'm slipping this time round then :) Just got home and looked at my receipt. Doesn't actually have a barcode for the product on the receipt. I suppose they just scan the barcode in the picture above? lidl do them - when in stock cost about £4, saxton, b&amp;q, etc - ebay amazon etc etc have them .. in fact it is a 210mm x 30mm blade which is quite widely available . 30mm is the bore size. Where did you source your replacement blade from? it's started smoking after doing laminate flooring, which means the blade it shipped with is clearly not very good. I bought one of these when they were £60. Brilliant tool, worth every penny. Thanks i just cracked it .. This stand is very robust and well made. It is fairly light in weight and folds away easily. It can accommodate my variety of saws and makes working with them so much safer. The purchase cost was far lower than all of the better known brands. will this works with evolution saw? Compound is the same thing, but this also has a sliding function, so more flexible. This is arguably better than a static compound saw. This is a sliding compound mitre saw I believe? Not sure what do you think is difference between this and "compound" saw? I'd be tempted to go for a compound over sliding. Left one of these to the recycling centre yesterday. I got it for around 40 quid from their own side in 2017 iirc, grade b or c or something like that. Worked fine for a few DIY jobs and then the it started to smoke (and sparks and actual fire later) I took it all apart and I could see part of the winding had black mark, shot possibly. Anyway, took the 240AC to 3v transformer, switch and laser out of it for DIY stuff, and the blade of course. Chucked the rest into recycling. Shame, it was a good saw. Da with great luck a couple of passing brass rubbers were able to give assistance. Actually I don't like the taste of bare metal. So I make sure the dog has a go. I have the 240v version and it's excellent. Definitely the best saw I have. Well worth £80 if you can use 110v. just done a new staircase with one of these, absolute piece of cake well worth the money. yeah mine is a 210 sliding and even that i find myself wanting greater capacity regularly, waiting for a good deal on a sliding 255 one. wouldnt recommend a 210 fixed. Yeah, get a slliding one. So much more useful for not a lot more money. 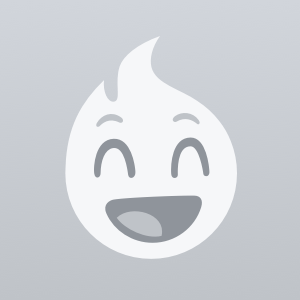 Get's good reviews and decent enough spec to cover most needs. Great price for a sliding mitre saw. That's annoying that the instructions are incorrect. Thanks for the warning. So its clockwise to loosen and anti clockwise for tightening? I'm not sure with this one specifically, but from memory I think mine has a 210mm blade. It can cut through a 75mm fence post in one go but can't manage a 100mm one, without removal of the safety guard and tipping the post up at the end of the cut (neither of which I advise or recommend, obviously) (y) . Yeah no need to mount. I regularly use mine with it sat on a gravel drive. Do you happen to know the maximum width that this can cut? B&amp;Q Dartford had these at £25 earlier this week!! Not sure if any left now. I bought two so I could sell one on for a profit. Alright for rough work, fences, shed building, firewood and stuff. Too much slop in the head and rails for finishing/trim work. Laughable when put side by side with a quality saw. Don't know if it's still the case but can't get decent fine tooth blades that will fit it either coz it's got an odd size bore so your stuck with the low tooth/rough work blades. Heat for price tho, be hard pushed to find a cheaper slider. The green version is the same price now aswell. Think the orange has a 6mm depth on steel versus a deeper cut on the green on wood. Yes, a bench or whatever. Or you can buy specific stands for some of them (not sure about this one) but most of the stands are universal so will fit most. The stands have extension rails to keep the wood level &amp; supported whilst cutting. What do I need to mount this on while cutting? Just any flat surface? Found this machine more accurate and easy to cut MDF skirting boards on my DIY project . Better cut and powerful feel then an expensive nice brand machine which I used previously. Hope it lasts for few years (as stated 3 years warranty the least). Not bad for DIY use I think. Seems to have gone back up... Shame as was sold on this. I have an older version of this (the blue one) and it's a decent saw and a bargain at this price. 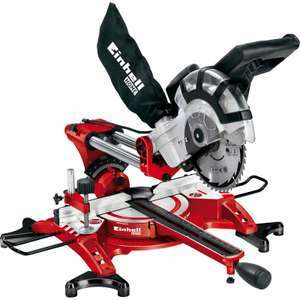 If I remember correctly all Einhell stuff has a 2yr guarantee as well?